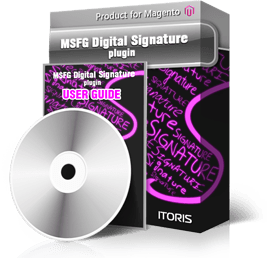 Digital Signature is a special plugin that will work in compatibility with SmartFormer Gold (Magento Form Builder). Now supports Tablets and Smartphones on iOS, Android and WinMobile! The plugin adds ability to insert digital signature functionality to forms. In plenty of countries digital signature is considered to be legal, so now signing agreements and contracts can be fast and simple. You can create form-based agreements where your customers will populate the required data and insert digital signature there so that to substitute usual signing with online one. No special tools are required for signing - only a computer and a mouse. Once a signature is created - it is converted into image and can be inserted in the body of email templates together with the agreement’s information. It can be saved in DB as well. This plugin is dependent on SmartFormer Gold Magento extension. It can be installed and will work only together with the extension.